The Raspberry Pi has been available for over 12 months now. Its launch was met with feverish excitement, but once the initial scramble for stock was over and people had a precious Pi cradled in hand, many turned to the question of what to do with all its potential. In response to that human need to gather over a common interest, Raspberry Jams have popped up across the UK. Raspberry Jams concept was devised by ICT teacher, Alan O'Donohoe. A long-time supporter of improved computing teaching in schools, Alan speaks at many education events on the subject, but his work promoting Raspberry Jams has led him on a different path to become, if you will, a self-proclaimed 'Jambassador'. He helps groups around the world to promote better understanding of computing for children. Alan has worked closely with the Raspberry Pi Foundation, Mozilla and Google to create more opportunities for kids, and adults alike, to learn. We've interviewed Alan and number of Jam organisers about the network that's spread across the globe. Linux Format: For those that don't already know you, can you tell the readers about your background? Alan O'Donohoe: I am the Principal Teacher of IT and Computing at Our Lady's High School, Preston. I have been teaching for about 20 years. As a child I moved from Ireland to England, and when I was about 11 years old I saw my first computer, a BBC Micro. During my time at school, the teachers weren't very knowledgeable about computers, I asked my teacher when I could use one, to be told that I would have to come in at break as there were very few computers available. I learnt to program in BBC Basic, using books and magazines, I loved the idea of making the computer do what I wanted it to do. LXF: What gave you the idea to start the Jams? AO: A few years ago, I was teaching ICT, and realised that we needed to change the way that ICT was taught in schools. I wanted to bring Computer Science into the classroom, even though I had not studied Computer Science myself. I started reading up on the subject. I was looking around for resources and tools, but one of the problems I faced was the limitation of installing software on the school's computers, as they were heavily locked down. At the same time I was reading about an upcoming device, called the Raspberry Pi. The Pi would allow me to teach computer science to my students, as they would not be as restrictive as the school's sytems. I started a Coding Dojo in my school. A dojo is similar to karate lessons, where the group learn coding skills in the same way that karate students learn via katas. The dojo led to a much larger event, Hack to the Future, a one-day unconference for children. This event had makers, hackers and IT industry figures interacting with children who learnt a whole lot more about computing. I was sure that if I got hold of a Raspberry Pi that I would be able to do lots of amazing things. So I thought, if I couldn't get hold of a Pi, then I would find people who have been able to. 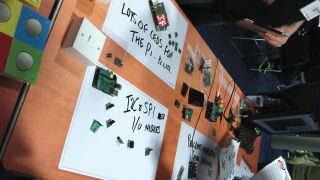 But, I was unable to find anyone who had a Pi, so I had the idea of running a group or event that would persuade people to come along with their Raspberry Pis, and show what they were doing with it.